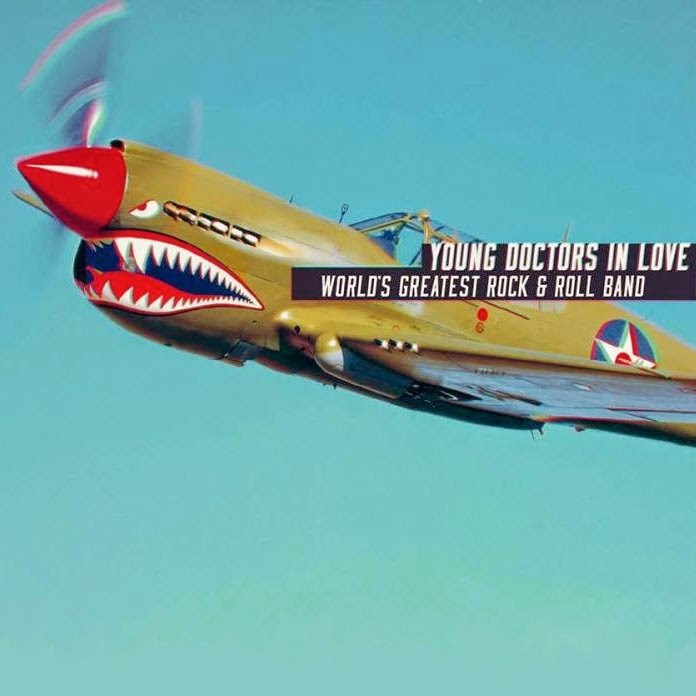 Ask three different members of Toronto's Young Doctors In Love how they would describe their music to someone who hasn't heard them before and you'll get three different answers. And that's the way it should be. The band's songs bounce around from influence to influence. But all the answers will hint at the heart of the group's upbeat indie-pop sound. "Post-garage-indie-new-wave-surf-synth-art-power-pop-rock," is how guitarist Clay Puddester puts it, while vocalist Amanda Li opts for a slightly less complicated answer: "We're the Canadian version of God Help the Girl. Except Clay is our Stuart Murdoch." Bassist Jon Marck goes yet another route: "Like getting shot by a million Nerf guns, then having 4 gallons of purple paint dropped on you. Also cocaine." Amanda: Bjork. Because she's the queen of awesome. Clay: Crosby and Stills. If Nash is there we will NOT play. Jon: Timber Timbre, just to see what he does when we make him join us onstage to sing the backgrounds to "10:35." Amanda: Royal Albert Hall in London. Or the Dakota Tavern in Toronto. Two vastly different venues, but each one has their own significance. Clay: Thomas Pynchon's living room. 3. What’s the craziest live show you've ever seen? Amanda: Girl Talk. I took a shower in more than 50 people's sweat. It was kind of glorious. But how weird is it that people go crazy while one person on stage just pushes buttons on a machine? Clay: I saw some ants really get into a piece of leftover pizza once. 4. Say, for some strange reason, all the music in the world is going to be destroyed, but you can save all the songs from one decade. Which decade's records would you save? Amanda: The 90s. Because Clay thinks it was the decade that had the worst music. Totally untrue, man! Clay: Any decade but the 90s. Debussy's "Prelude a l'apres-midi d'un faune" is pretty good and Mahler wrote some nice pieces, but overall it was a really bad time. Jon: It's between 60s and 70s, isn't it? I guess 70s. If I could pick a 10 year stretch: 1966-1975. Really, though, 90s. ﻿﻿﻿﻿﻿﻿﻿﻿﻿﻿﻿﻿﻿﻿﻿﻿﻿﻿﻿﻿﻿﻿﻿5. If you could switch places with another musician in some type of "Freaky Friday" type incident, who would you want it to be? Amanda: Bjork. Because she's an insane genius and no one in the music industry comes close to her talent and vision. Clay: Ranking Roger from the English Beat. I hear he's teaching rollerblading lessons now. I've always wanted to teach rollerblading. Jon: I'm a bassist so I guess I'm supposed to pick Flea but I'd rather pick a band that hasn't peaked yet. Arcade Fire? No… Well…maybe… but they definitely peaked early… Really I just want to be a dirty, homeless violinist with a gross beard and personality disorder. WHERE'S THE BIRTH CERTIFICATE HARPER?? ?